Don’t you just love teaching tricky verb tenses? Nope, not really! In particular, the past tenses and the subjunctive can be so troublesome to teach. But why are they so hard to teach? Well, for the first thing, many of us aren’t teaching our students the way that native speakers learn. If you’re interested, read the beginning of this series, “How Native Speakers Learn Differently Than Language Students” here. To sum it up, it’s very difficult to replicate the repetition that you get as a native speaker with your parents speaking to you 24 hours a day. As teachers, we often only have between 1 and 5 hours a week with our students. 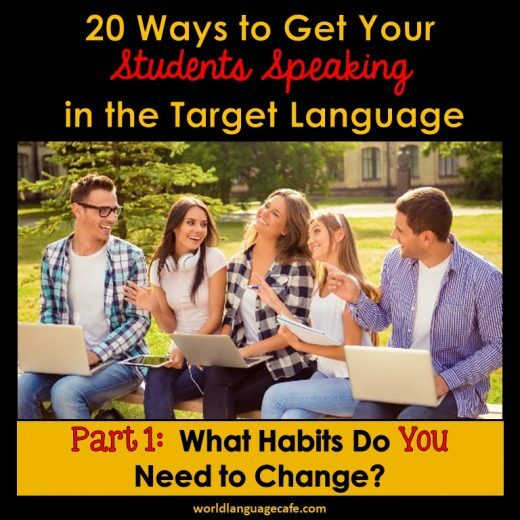 For this reason, I’m taken some of the ways that native speakers learn and created a hybrid system so that even though we don’t have as much time with our students, we can still teach them effectively in native-like situations. 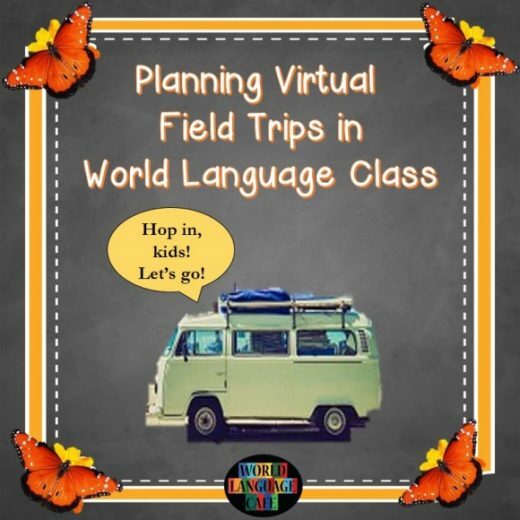 Here are a few solutions to get your students speaking more fluently instead of conjugating verbs in their heads. When you’re teaching a new tense, instead of teaching the full conjugation with all the subject pronouns, start with teaching just the “I” forms and then the “you” forms. Almost all of our natural communication is in these forms, so focus on them first. 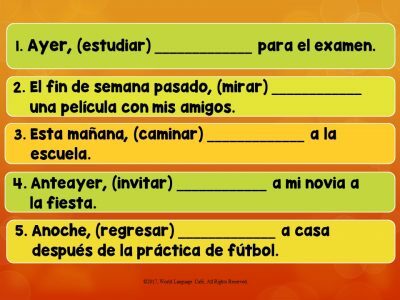 Teach regular verbs, reflexive verbs and irregular verbs in just these two forms. Here are a few examples from my Spanish Preterite Imperfect Unit. 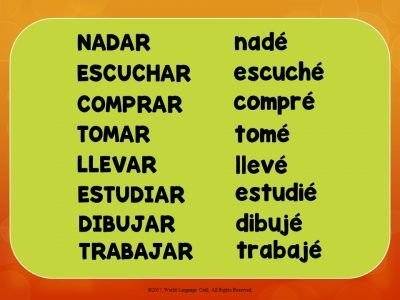 For those of you who don’t speak Spanish, the first slide shows the formation of regular verbs in the “I” form, the second slide is practice (students click to see the answer), and the third slide has fill in the blank sentences using the “I” form. 3. Practice, practice, practice. Have students ask each other questions and spend extra time with any irregulars. Create small activities using especially awkward, but common irregulars so that students get used to hearing them and using them. Tip: Pick 3-4 irregulars to work on each day. If you teach them all at once in a huge list, it’s much harder for students to learn them all (and remember, learning in lists is not how native speakers learn). 4. Once students have mastered these, add the he, she forms, then the they forms, and finally, the we forms. You’ll find that these are so much easier once students have mastered the first two forms. Want more than just a few tips? 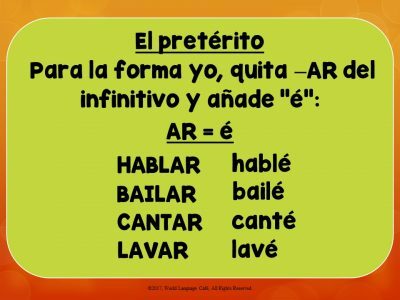 Find ready-made, teacher tested French and Spanish resources here including this 400 page preterite, imperfect unit. And get free engaging and innovative lesson plans in my Free Resource Library. Sign up at the bottom of this post and then check your email for the password and access link. 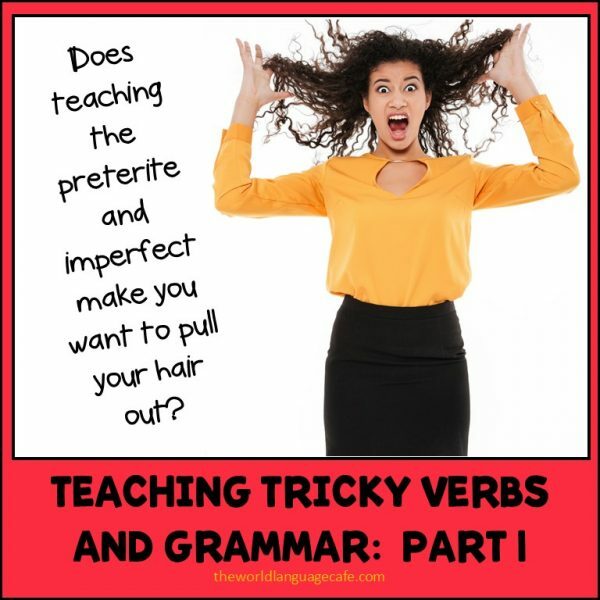 Keep reading to find out more about teaching tricky irregular verbs in Part 2 of How to Teach Tricky Verbs and Grammar.